When I am working with developmentally delayed students, I am always looking for ways to make age-appropriate activities Many of my students do not speak, but do have the ability to communicate using some sort of augmentative alternative communication (AAC) such as a one-button switch or a communication device. One of the ways we've been able to incorporate the use of AAC is at our annual Haunted House Party in our school gymnasium. We've been very fortunate to have great community support from local businesses and organizations as well as peer mentors from neighboring high schools. In other words, our haunted house is kind of a big deal for our school. So, when you want to set up an activity that uses AAC, you have to think of all of the potential communication opportunities that might occur. Halloween is great because it is a social event in which almost all kids participate. I actually thought of an idea while handing out candy in my neighborhood. 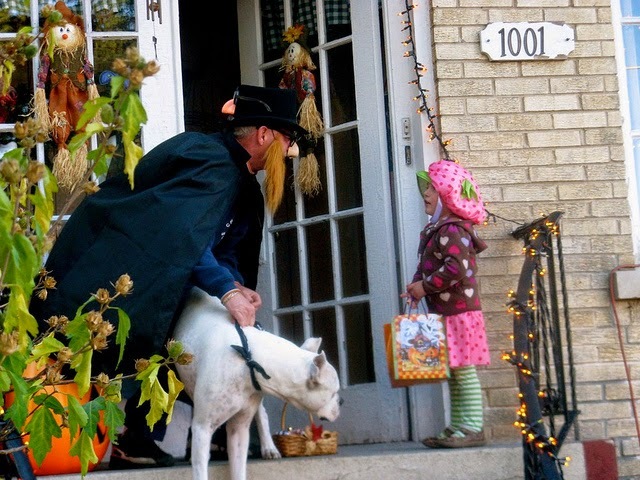 Wouldn't it be great if kids who didn't speak or who were too shy to speak to have the opportunity to say the obligatory trick or treat and thank you? I get many kids at my doorstep that don't say anything. Some people might take this as the kid being rude or having bad manners, but I see it from a different point of view--maybe they can't communicate very well. I haven't done it yet, but I have considered a two-button switch with trick or treat on one and thank you on the other. So think about it--what are some typical phrases said at Halloween? That's part of the fun. Okay, now let's get to our AAC equipped haunted house. From a student's point of view, it's a must to record messages either on a communication device that he or she can carry along from station to station. Or, you can place simple switches at each station with at least trick or treat programmed. We happen to have a bunch of old Superhawks and Cheap Talks at our school. It's been a great way to re-use some older, less techie devices. Another fun way to use these devices is to place them throughout the haunted house with spooky sounds like a witch's cackle or a werewolf's howl. Place them in conspicuous areas so that people come up and push the buttons. Try a sequencer with a bunch of sounds! The kids will love it. Power Link 3 by Able Net, Inc.
Another cool aspect of Halloween is its huge variety of decorations. Have you ever seen the skeletons that dance when you push a button or when you walk past it? 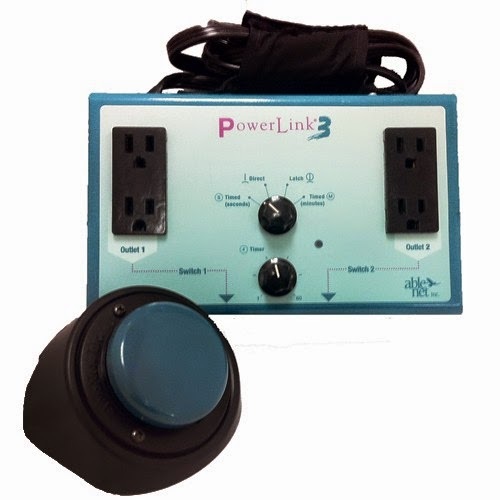 You can hook these up to a PowerLink3 (that's what I have) which allows you to control an electric device with a switch. For example, I've used a Big Mack (with a scary sound programmed) and attached it to a red police light (you know, like a siren). Kids love it because they get both auditory and visual feedback while using a switch for cause and effect. You can use the switch with plug-in jack-o-lanterns too. Really, there's a ton of Halloween decorations that will work. One of my favorite pieces of technology in our school is the Tap It. If you're not familiar with it, it's a portable touch screen SMART Board. What I've done with this has been a fan favorite for the last few years. I stumbled upon Inclusive Technology's webpage (and apps) and found an AAC activity called "Aunt Maggie's Recipe". By the way, this website is awesome for AAC users (that's a whole other blog post)! Anyway, as people go by, a welcoming boy or girl waves at them. Using the Tap It, students can select worms, eye balls, frog legs, and more to stir into the cauldron. When finished with the potion, they click for the boy to drink the solution and then he changes into a monster and does a silly dance. Really, it's one of my favorite interactive apps. You can, by the way, set it up for switch scanning. Finally, I couldn't talk about Halloween without mentioning a Jib Jab. It's not necessarily a switch activity, but it is certainly of of the all time favorite activities for my students. The website allows you to insert your face onto dancing bodies. The Halloween ones are great as you can do The Monster Mash or the Halloween Rap among others. Check it out. I guarantee laughter with this website. How about you? Any creative ideas for using switches?